I am not from the South. 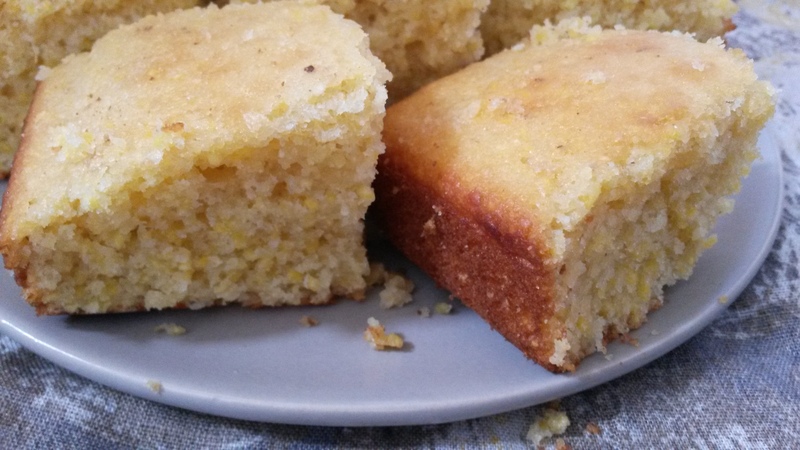 As a result, the only cornbread I’ve had is closer to cake than actual, southern cornbread. Actually, I’ve had southern cornbread; I just try to push the memories of bitter, crumbly cornbread out of my mind because it’s not the cornbread I know and love. I’ve tried a few recipes, and I’ve found I most like those that call for equal amounts of flour and cornmeal. And, of course, the ones that call for lots of sugar. My bag of cornmeal tried to convince me that 1 tablespoon of sugar would be sufficient. Even more insultingly, it added in parentheses that the tablespoon of sugar was “optional.” How dare you, Bob’s Red Mill. Sugar is never optional. I laughed in Bob’s face as I added a heaping half-cup of sugar to the batter. Shauna 1, Bob 0. Now that I’ve insulted my source of cornmeal, it may be time to discuss its merits. 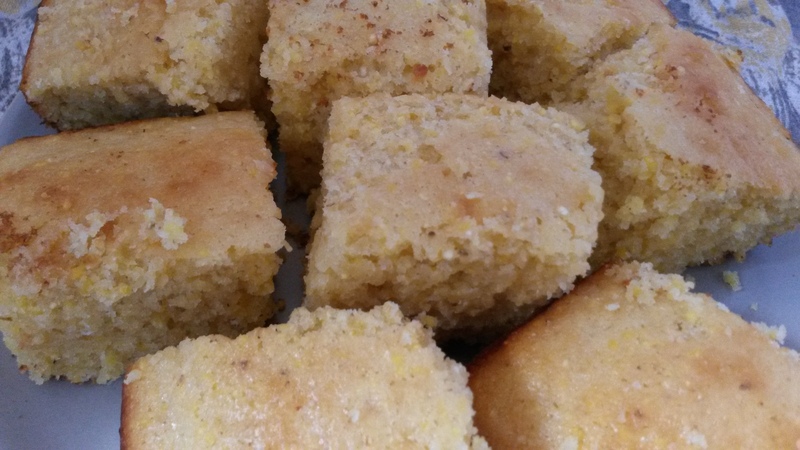 My first encounter with this cornmeal was via the cornbread a friend had made. The texture was slightly gritty, in a good way, and I could see little yellow specks of cornmeal in the bread. 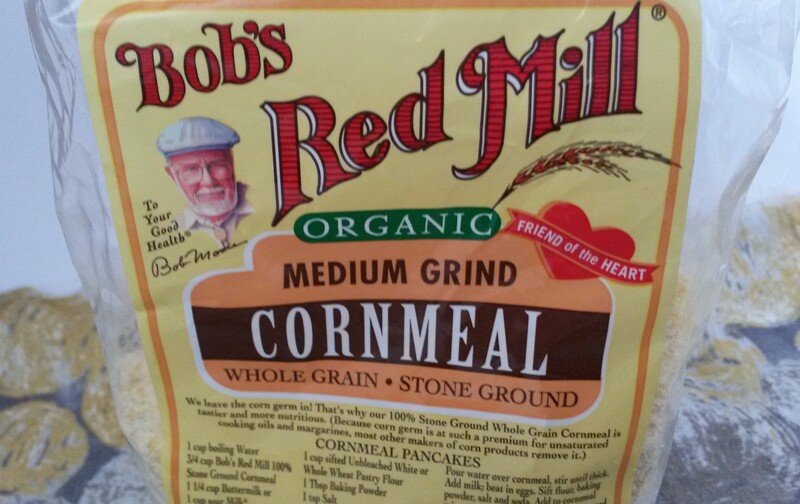 She told me she used a medium grind cornmeal from Bob’s Red Mill. Being stone-ground, the corn’s hull and germ are left in, giving the cornmeal a heartier texture and cornier flavor. This makes it slightly healthier than the standard steel-ground cornmeal, which, as far as I’m concerned, means it balances out all the sugar. Yesterday, I set about making cornbread for the first time in several years. I used to make it on a regular basis, but at some point I lost my go-to recipe and the recipes I’ve tried since haven’t been the same. Yesterday I used a recipe I’d written down years ago on a tiny Post-It. If I wrote it down all those years ago and never threw it away, that must mean it was a success, yes? How wrong I was. The recipe called for more liquid and eggs than was logical, so that when the timer went off I opened the oven door to find an overly buttery, wet, eggy cornbread that was burnt around the edges and unforgivably soggy in the center. Into the garbage it went, and I immediately set about baking another batch with a recipe I found on AllRecipes. It had the 1:1 ratio of flour to cornmeal, it only called for one egg, and the 2/3 cup of sugar it required sounded familiar. All good signs. And success! This recipe had all the right factors. 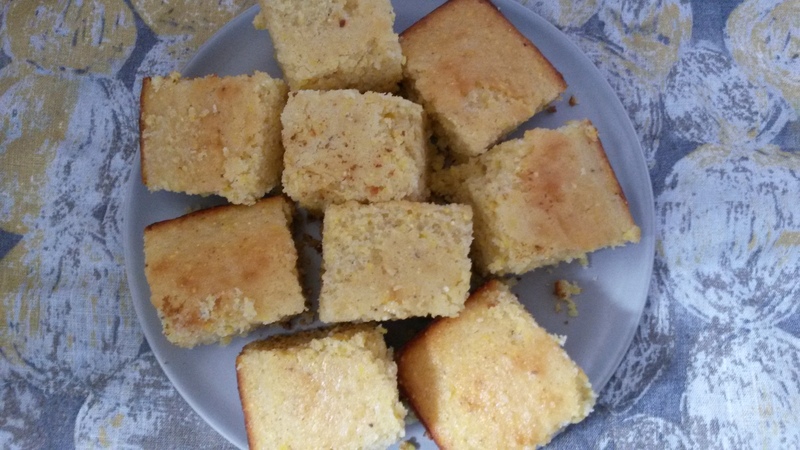 I reduced the 2/3 cup of sugar by a few tablespoons and in the end I had made a cornbread that was gritty but soft, sweet but not overly so–a drizzle of honey on top wouldn’t be overkill. Preheat the oven to 400 degrees and grease an 8×8 or 9×9 pan. Combine the flour, cornmeal, sugar, salt, and baking powder. Create a well in the center of the mixture and add in the egg, milk, and vegetable. Stir until combined and pour until the pan. Bake for 20-25 minutes or until the edges are browned and a toothpick inserted into the center comes out clean. Looks moist! I like the honey call.